Jason Cummins when he played at Easter Road. Picture: Ian Georgeson. Celtic and Rangers chase same player, Celtic close to signing teen striker and Aberdeen star could make move down south. Former Hibs and Rangers striker Jason Cummings has completed a season-long loan move to Peterborough. The 22-year-old spent the second half of last season at Ibrox after failing to cement his place in the first-team at Nottingham Forest. Rangers decided against trying to bring the striker back to the club despite reportedly having a first-refusal clause inserted into the deal, and he found himself still frozen out by City boss Aitor Karanka when he returned down south. Prior to his move from Easter Road in the summer of 2017, Cummings was viewed as one of the brightest prospects in Scottish football. Both Celtic and Rangers are said to be chasing left back Milad Mohammadi from Iran. 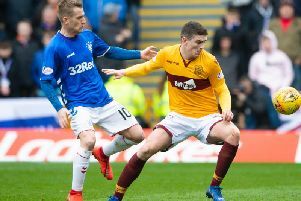 Rangers were already linked with a move for the defender last week and now the Scottish Sun reports Celtic have shown interest. Mohammadi impressed during his time on the pitch at this year’s World Cup. Celtic are closing in on the signing of highly-rated 16-year-old striker Armstrong Oko-Flex from Arsenal. The Dublin-born youngster has played seven times in the Under-18 Premier League, scoring one goal and registering one assist. Also able to play on the left wing as well as up top, Oko-Flex joined Arsenal from St Kevin’s FC and has played schoolboy football for both England and Ireland at Under-15 and Under-16 level. Rangers are still waiting to hear if Millwall have accepted their £3million bid for Jake Cooper, according to The Scottish Sun. Manager Steven Gerrard has said he’s in the market for a left-sided central defender. Chief scout at Dundee United says he has taken over 100 calls from agents of players on the club’s list of possible signing targets. According to the Evening Telegraph, Paul Sturrock says he’s hoping the next 10 months will show how hard he, manager Csaba Laszlo and the other members of the back-room staff have been working. He said four more new signings are still planned. Aberdeen player Adam Rooney could be moving to Salford City. City - which is part owned by former Manchester United players Gary and Phil Neville and Ryan Giggs, was promoted to the National League last term. Boss Graham Alexander wants Rooney as part of his bid to move into the Football League for the first time in the club’s history. Livingston player-boss wants to enlist another coach to help ease the burden of his first campaign. According to the Daily Record, Kenny Miller has admitted he needs additional support ahead of his first competitive game in today’s Betfred Cup clash at Airdrie. The striker, 38, plans to make himself available for as many games as possible.